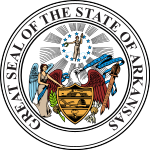 The 2018 Arkansas gubernatorial election was held on November 6, 2018, to elect the Governor of Arkansas, concurrently with elections to the United States Senate in other states, elections to the United States House of Representatives, and various state and local elections. Incumbent Republican Governor Asa Hutchinson won reelection to a second term. ^ a b c d Wickline, Michael R. (January 3, 2017). "Arkansas governor to hold fundraiser for term 2; re-election bid not yet formally announced". Arkansas Democrat-Gazette. Retrieved January 3, 2017. ^ Wickline, Michael R. (May 17, 2017). "Arkansas Gov. Asa Hutchinson to pursue second term". Arkansas Democrat-Gazette. Retrieved May 18, 2017. ^ Lanning, Curt (October 3, 2017). "Gov. Hutchinson May Have a GOP Challenger". KNWA-TV. Retrieved October 5, 2017. ^ "Republican Jan Morgan Announces Run for Arkansas Governor". U.S. News and World Report. January 1, 2018. Retrieved January 3, 2018. ^ Ramsey, David (April 18, 2016). "Lt. Gov. Tim Griffin "opposes Obamacare" (duh), dodges questions on "Arkansas Works"". Arkansas Times. Retrieved July 13, 2016. ^ DeMillo, Andrew (July 11, 2016). "Lt. Gov. Griffin says he's seeking re-election". Log Cabin Democrat. Retrieved July 13, 2016. ^ Donald J. Trump. ". @AsaHutchinson, the great Governor of Arkansas, is in a primary tomorrow. He has done an incredible job with a focus on lower taxes, border security, and crime prevention. Asa loves our military and our veterans. I fully endorse Asa for Governor!". Twitter. ^ "NRA Endorses Governor Asa Hutchinson In Re-Election Bid". 5newsonline.com. September 20, 2018. ^ "EDITORIAL: For Asa Hutchinson". Arkansas Democrat-Gazette. October 23, 2018. ^ Brock, Roby (December 12, 2017). "Jared Henderson to run as Democratic candidate for Governor". Talk Business & Politics. Retrieved December 12, 2017. ^ "Meet Jan Morgan, GOP Candidate For Arkansas Governor". KFSM. March 27, 2018. Retrieved April 8, 2018. ^ Brock, Roby (November 28, 2017). "Former State Rep. Jay Martin eyeing run for governor on Democratic ticket". Talk Business & Politics. Retrieved November 29, 2017. ^ "Martin says time is not right to run for Arkansas governor's office". Talk Business & Politics. December 1, 2017. Retrieved December 12, 2017. ^ "Radio host Bobby Bones considering run for Ark. governor". THV11 Digital, KTHV. January 3, 2017. Retrieved January 3, 2017. ^ Taha, Nada (March 14, 2017). "Bobby Makes Official Statement On Political Plans". The Bobby Bones Show. Retrieved May 18, 2017. ^ "Race Ratings, Politico predicts". Politico.